spread throughout 13 city blocks! It is written, in ancient Mayan glyphs, that on the 13th day of the month of May in the year 2012, a celebration of peace will occur. Join us as we celebrate the unfolding of our potential, and the unlimited possibilities of the future. on Sunday for another amazing How Weird Street Faire! 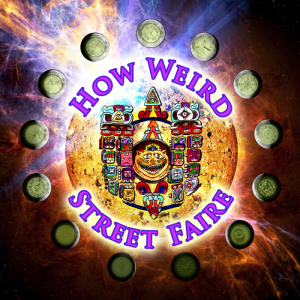 Sign up for the How Weird mailing list! Using the power of software to build peace. We’re looking for computer programmers, software engineers, and people from technology companies who want to use their talent and resources to help bring peace to this planet. The greatest street faire in the galaxy!